In the United States, a district attorney (DA) is the chief prosecutor for a local government area, typically a county. The exact name of the office varies by state. Except in the smallest counties, a district attorney leads a staff of prosecutors, who are most commonly known as deputy district attorneys (DDAs). The Deputy who serves as the supervisor of the office is often called the Assistant District Attorney. The majority of prosecutions will be delegated to DDAs, with the district attorney prosecuting the most important cases and having overall responsibility for their agency and its work. Depending upon the system in place, DAs may be appointed by the chief executive of the jurisdiction or elected by local voters. The district attorney, and assistant district attorneys under the district attorney’s authority, are the attorneys representing a government body as prosecutors who are responsible for presenting cases against individuals and groups who are suspected of breaking the law, initiating and directing further criminal investigations, guiding and recommending the sentencing of offenders, and are the only attorneys allowed to participate in grand jury proceedings. The United States Judiciary Act of 1789, Section 35, provided for the appointment of a person in each judicial district to prosecute federal crimes and to represent the United States in all civil actions to which it was a party. Initially, there were 13 districts to cover the 11 States that had by that time ratified the constitution. Each State was a district, except for Massachusetts and Virginia which formed two. Districts were added when additional States were admitted. The statute did not confer a title upon these local agents of federal authority, but subsequent statutes and court decisions referred to them most frequently as "district attorneys". In 1948, the Judicial Code adopted the term "United States attorneys". This term for a prosecutor originates with the traditional use of the term "district" for multi-county prosecutorial jurisdictions in several U.S. states. For example, New York appointed prosecutors to multi-county districts prior to 1813. Even after those states broke up such districts and started appointing or electing prosecutors for individual counties, they continued to use the title "district attorney" for the most senior prosecutor in a county rather than switch to "county attorney". 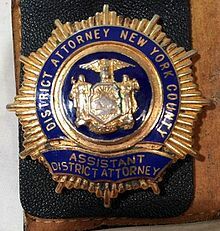 District attorney and assistant district attorney are the most common titles for state prosecutors, and are used by several major jurisdictions within the United States, such as California, Delaware, Georgia, Massachusetts, Nevada, New York, North Carolina, Oklahoma, Oregon, Pennsylvania, Texas, and Wisconsin. In St. Louis, Missouri, the title is circuit attorney, while in St. Louis County, Missouri, the title is prosecuting attorney. Alternative titles for the office include commonwealth's attorney, state's attorney, county attorney, circuit solicitor, or county prosecutor. In the United Kingdom, the equivalent position to a district attorney is a chief crown prosecutor, and the equivalent to an assistant district attorney is a crown prosecutor. These prosecutors work under the Crown Prosecution Service in England and Wales, the Procurator Fiscal in Scotland, and the Director of Public Prosecutions in Northern Ireland. In many other countries, the title of the chief prosecuting officer is Director of Public Prosecutions. In Canada, the equivalent position to a district attorney is a crown attorney, crown counsel or Crown Prosecutor depending on the province, and the equivalent to an assistant district attorney is the assistant crown attorney, assistant crown counsel or assistant crown prosecutor respectively. The assistant district attorney (assistant DA, ADA), or state prosecutor, is a law enforcement official who represents the state government on behalf of the district attorney (DA) in investigating and prosecuting individuals alleged to have committed a crime. In carrying out their duties to enforce state and local laws, ADAs have the authority to investigate persons, issue subpoenas, file formal criminal charges, plea bargain with defendants, and grant immunity to witnesses and accused criminals. Administrative assistant district attorney (admin ADA), executive assistant district attorney (exec ADA), chief assistant district attorney (chief ADA), or first assistant district attorney (First ADA) are some of the titles given to the senior ADA leadership working under the DA. The chief ADA or first ADA, depending on the office, is generally considered the second-in-command, and usually reports directly to the DA. The exact roles and job assignments for each title vary with each individual office, but generally include management of the daily activities and supervision of specialized divisions within the office. Often, a senior ADA may oversee or prosecute some of the larger crimes within the jurisdiction. In some offices, the Exec ADA has the responsibility of hiring lawyers and support staff, as well as supervising press-releases and overseeing the work of the office. Some District Attorneys maintain their own law enforcement arm whose members are sworn peace officers. Depending on the jurisdiction, they are referred to as District Attorney Investigators or county detectives. ^ a b "Standards on Prosecutorial Investigations". abanet.org. American Bar Association. 2017. Retrieved November 13, 2017. ^ "History of the Federal Judiciary – Federal Judicial Center". www.fjc.gov. Retrieved November 13, 2017. ^ "City Of St. Louis Circuit Attorney's Office – Kimberly M. Gardner – Circuit Attorney". www.circuitattorney.org. Retrieved November 13, 2017. ^ "Home". www.stlouiscopa.com. Retrieved November 9, 2018. ^ "About The CPS : Chief Crown Prosecutors". www.cps.gov.uk. Retrieved November 13, 2017. ^ "Crown Prosecutor Careers: The Crown Prosecution Service". www.cps.gov.uk. Retrieved November 13, 2017. Wikisource has the text of the 1905 New International Encyclopedia article District Attorney.